Porcelain veneers are custom-made shells made of porcelain that stick to the front side of your teeth to make your smile beautiful. These are created to solve certain oral problems. 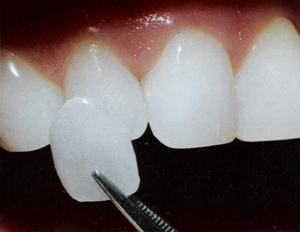 Porcelain veneers are created to match the shape, size, shade and translucency of your teeth. They can be made in a lighter shade so that they are whiter than before. Dr. P.S.Bagga at Caliber Dental will examine your teeth and decide whether porcelain veneers are the best solution for the result you seek. As the first step Dr. P.S.Bagga will remove a small amount of tooth enamel from your front of your teeth to evaluate the thickness of the veneers, which thinner than a contact lens. Impressions of your teeth are taken and sent to the veneer dental lab with some specific instruction to create the veneers. While your veneers are being created, you will be given temporary veneers. These temporary veneers itself are very effective to use. After a span of 2 to 3 weeks, Dr. Bagga will inform you at their arrival. After arrival, you have the rights to approve or send them back for better results. Right after approval from you, Dr. Bagga will bond them with your teeth with a special bonding agent that will be brushed onto your teeth. A high-intensity light will be directed towards the porcelain veneers to glue them permanently on your teeth. These porcelain veneers are stain resistant and provides a beautiful brighter smile than before. They are perfect for various dental problems.